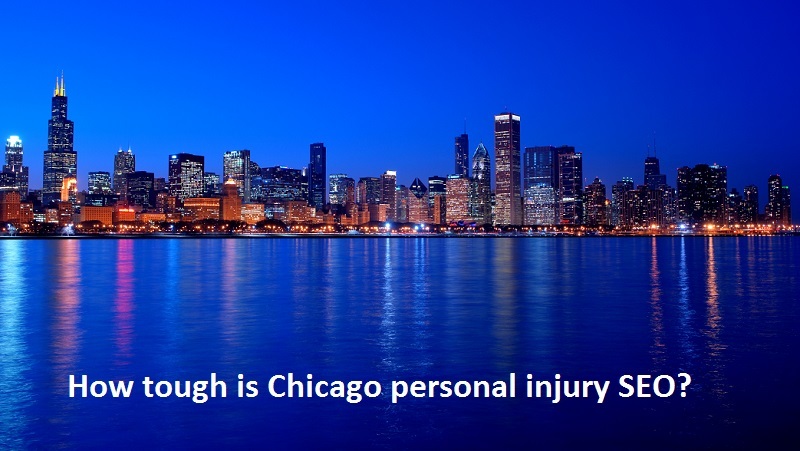 Home → SEO: Case Studies → Chicago IL Personal Injury Lawyer SEO – How Tough is it? If you are new to this blog, welcome. My name is Len, I’ve been online since the late 1980s and I do SEO for some of the most reputable personal injury law firms in the country. I’m not here to discuss the latest elite new SEO tactics though. haha. (If you want those read my last 1,000 articles on this site). Today folks, we are going over the SEO scene in Chicago for PIs. Billions of dollars worth of personal injury lawsuits are litigated at the Cook County Circuit Court in the Richard J. Daley Center, and just a couple of blocks down from there on Dearborn Street, other tort cases are heard at the Dirksen Federal Building. Insurance is very big business in Illinois, and so is the practice of personal injury law in the Chicago Loop. Below is a glimpse into how injury lawyers battle for key positions in Google. The people at the top here have obviously either gotten their feet wet in SEO and learned the basics and hired professionals as well. Looking at the backlink portfolios of Chicago injury lawyers has been a hobby of mine for at least 6 years now. Donating to charities, joining the chamber, guest articles, free taxi rides – anything goes here to get some links from high pagerank sites or domains with authority. Other attorneys do linkbuilding, submit themselves to directories, run multiple off-site blogs, promote infographics, network, the list goes on to build links. Others get into grey areas of SEO by hunting down .EDU links and offering college scholarships, paying for mentions in the news, issuing press releases, etc. Still others just jump straight into the black hat world and violate every policy Google has in place for short lived results, but hey, they are results. When it comes to Chicago, it is a straight up war requiring dedicated resources, money, and risks. Having worked with LA lawyers for quite some time I can say that New York, LA, and Chicago are hands down the toughest of the tough. Solos have no chance (online) here unless they have a large budget and are willing to embrace content. Lots of content. Content about every imaginable question the injured could ask. Content covering accidents hours after they happen. Content, content, content. If I were a new attorney entering this market, I would move. That or plan on getting leads via a referral service or another method. Not nearly as competitive are the Chicago suburbs. 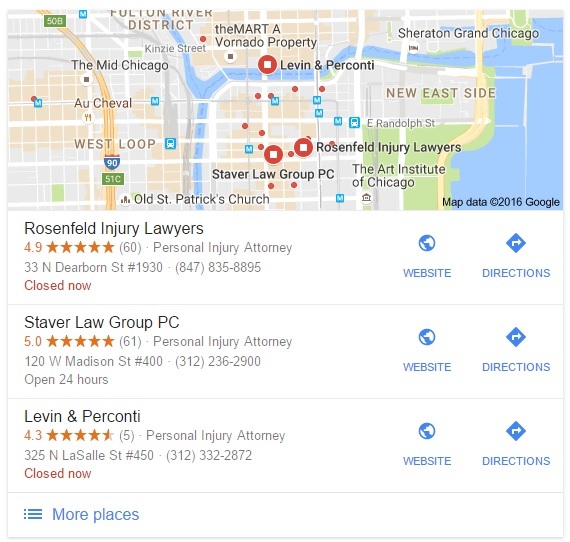 If you can rank for car accident lawyer in Elmhurst, you will capture the juicy local leads when people in Elmhurst search “car accident lawyer” from their phones with no geo-modifier. Chicago local rankings as of September 14 2016. Levin and Perconti have pretty much dominated the scene most or maybe all of 2016. At the time of this article they are right on top. It is no secret that they operate 5 blogs. Over the years I have wondered if Google would ever mistake their off site blogs as a PBN (a network of websites which exist to links back to a main site to manipulate search rankings). It scares me. They are not doing anything wrong; they have a Justia based website which lacks blogging capabilities, so they have off-site WordPress blogs. Anyways, the 5 domains links back to the main site over 40,000 times. I guess if you want to be #1 in Chicago you need 40,000 links. Rosenfeld Injury Lawyers. I like this place and see them all over the place. They have a rare on-site WordPress blog on their Justia site. I am not necessarily a Justia fan but this is a neat way to configure it (instead of simply running WordPress). All of their stuff is nice and meaty. They have paid close attention to their Google reviews and it has paid off as they display prominently in the local search results. Staver Law Group. The SEO company thinks like me in so many ways. I can’t tell if they read my blog or if they are just smart. It is *very* rare I praise another SEO company, so there you have it. I wonder how long it took to rank this site. The website is very pretty and the video on the home page really makes it pop. I am not going to mention here why this site ranks so well but rest assured they have used some creative approaches necessary to rank in Chicago. If you want to rank as well as Staver you will need to use all of the same tactics he did and then some. I only know of 2 people out there with the patience and ability to pull this off. Briskman, Briskman & Greenberg. I really like their podcast and am familiar with this site. I have my eye on this one. This is an interesting custom WordPress site. Corboy & Demetrio. A rising star- to be watched. Above is just who happens to be ranking in September 2016 for “personal injury lawyer”. As a personal injury content creator I know people are searching for all kinds of various topics and keywords. “Car accident lawyer” is another popular term. For searches like that, other attorneys show up well such as Willens Law Firm and Salvi, Schostok & Pritchard. Most of the attorneys listed above have their content structured nicely, run mobile friendly sites, have done HTTPS conversions, and, most importantly, have nice title tags in place. After that, on-site efforts are of minimal importance. Above I touched on the massively powerful links needed to rank in a niche like this one. In some cities, like in San Diego, this is not the case at all. To see which backlinks attorneys in San Deigo use see this article: San Diego personal injury SEO. If you do, please drop them below or shoot me an email. I network with a lot of attorneys who blog, so if you have any interest in doing a guest post please let me know that as well.